Eating certified organic food is one way you can avoid GM food because GM is prohibited in organic farming. 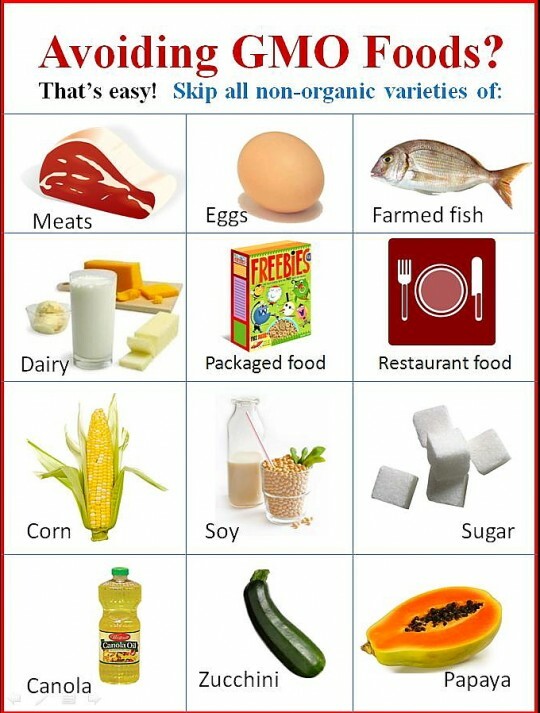 This includes organic dairy, eggs and meat because animals in organic farming are not fed GM grains like corn or soy. Avoid eating processed foods with corn, canola and soy ingredients. Buy cane sugar or organic sugar to avoid eating sugar from GM sugar beets. do not plant GM corn, canola or soy or use GM grains for meat, dairy or egg production. Foods that are genetically modified have a 5 digit code that begins with a 9. 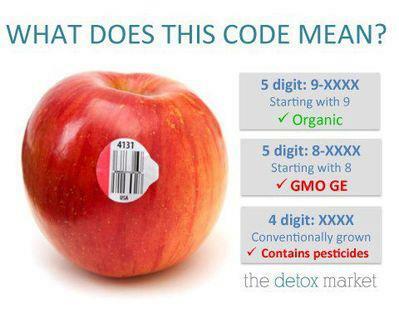 Foods that are organic, which cannot be genetically modified by definition, have a 5 digit code that begins with an 8. Lastly, foods that are neither genetically modified nor organic have a 4 digit code. 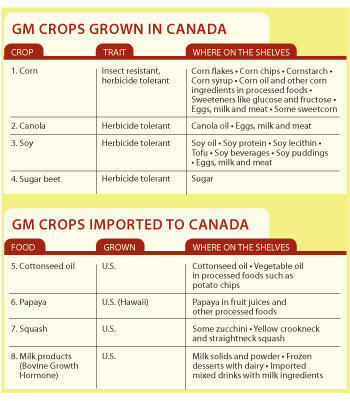 Based on CBAN, four GM crops are grown in Canada: corn, soy, canola and white sugar beet (for sugar processing). These are widely used as ingredients in processed foods. There is also now some GM sweet corn grown in Ontario and more could be grown in the future. GM papaya, cotton and some types of squash are grown in the U.S. and can be imported, mostly as processed food ingredients. GM Tomatoes: There are no GM tomatoes on the market anywhere in the world. GM Potatoes: Monsanto took GM potatoes off the market because of consumer rejection. GM Wheat: In 2004, Monsanto withdrew its request for approval of GM wheat in Canada and the US because of consumer and farmer protest. Monsanto has relaunched its GM wheat research. Most of the GM corn grown in Canada is hard corn used for animal feed or processed food ingredients. There is no GM popcorn on the market. There are a few varieties of GM sweetcorn now being sold in Canada. What Finger Foods can I Offer to My 10-month old Baby? At around 8 months of age, your baby might show an interest in feeding himself/herself. Finger Foods such as soft fruits (banana, peaches or pears) or steamed vegetables can be introduced at this time to develop self-feeding skills. What are finger foods choice do I have for my baby? Fruits – Peeled raw fruits such as bananas, pears, peaches, papaya or blueberries are good introductory finger foods. Vegetables – Steamed cauliflower, broccoli, beans or peas are good choices; Potatoes and yams cut in wedges and roasted are healthy alternative to french fries. Breads and Cereal – toast, whole-grain crackers and rice cakes; cooked pasta, whole-grain cereal such as Cheerios, cornflakes or spoon size shredded wheat can be served without milk. Meats and Proteins – small pieces of cooked chicken, beef, fish and cubes of soft tofu – you can serve them with homemade vegetable purees. Dairy Products – at around 9 months, dairy products can be introduced. Cheese can be served either grated or cut into thin slices. Most babies also enjoy melted on bread strips. Should I Feed My Baby Salt? Sodium is an essential dietary nutrient that plays an important role in metabolism and maintenance of blood pressure. Sodium occurs naturally in many foods such as cow’s milk, human milk, cheese, vegetables and grains. To adults, an excess of sodium can raise blood pressure and cause significant health problems in later life. As it’s not clear what the consequences of excess sodium are for infants, it seems wise not to use added salt when preparing baby food. Factors such as pregnancy, childbirth, aging, being overweight, and abdominal surgery such as cesarean section, often result in the weakening of the pelvic muscles. For me, I had the 1st and 2nd issues right after giving the birth. I even got an bladder infection 3 days after the birth. My OB suggested me to do Kegel exercises to improve the urinary issues like these. However at the first two month after giving birth, I couldn’t even tighten those pelvic floor muscles. I know how to tighten some muscles in that area, but I don’t know if I am doing it right. Therefore my OB referred me to a pelvic floor physio to help me find the pelvic floor muscles. I’ve seen a pelvic floor physio twice now to get post-natal pelvic floor retraining. Below are some key points from her. Find the right pelvic floor muscles. To identify your pelvic floor muscles, stop urination in midstream. If you succeed, you’ve got the right muscles. Practice your pelvic floor muscles . Once you’ve identified your pelvic floor muscles, empty your bladder and lie on your back. You can put a rolled hand towel under your low back. Tighten your pelvic floor muscles, hold the contraction for five seconds, and then relax for five seconds. Try it four or five times in a row. Maintain your focus. For best results, focus on tightening only your pelvic floor muscles. Be careful not to flex the muscles in your abdomen, thighs or buttocks. Keep breathing. Avoid holding your breath. Instead, breathe freely during the exercises. If possible, tighten the pelvic floor muscles while breathing out. Repeat 3 times a day. Like any other muscles in our body, to strengthen pelvic floor muscles, you need to practice them regularly. To expect results — such as less frequent urine leakage — within about a few months, aim for at least three sets of 10 repetitions a day. For continued benefits, make Kegel exercises a permanent part of your daily routine. 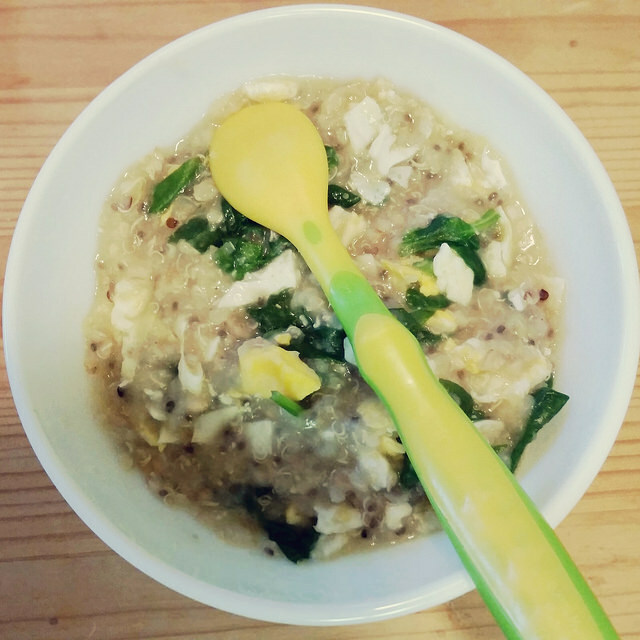 What Solid Food do I feed a 9-month Baby? We started feeding our LO solid foods when he turned 5-month. Our pediatrician recommended to start solid food at 4-month; but we waited for one more month just to be save. Now LO is at 9 month 3 weeks. What solid food have we fed him so far? If we have the choice, we always opt for organic food. Yes, it’s a little bit more expensive. However, since we are making baby foods at home, we save some money than buying those baby foods in jars. Our baby foods are made with loves and the best possible ingredients! When can I Feed My Baby Cheese and Yogurt? Based on The Baby’s Table, from 9 to 12 month, it is a sensible time to introduce calcium-rich dairy products, such as yogurt and cheese. Introducing them earlier than 9 month may increase the risk of gastrointestinal bleeding. Cow’s milk for drinking should be postponed until 12 months. What type of cheese and yogurt can a 9 months old baby eat? All cheese must be pasteurized. Cheddar, mozzarella, Edam, Gouda and cottage cheese tend to be popular with babies. To avoid the additives found in many commercial yogurts, choose a plain high-fat yogurt (any yogurt above 3% milk fat) and mix it with your baby’s favorite fruit or vegetable puree.